He says that he would not join with those who do not involve themselves in the qualities of emperumAnAr who is interested in serving the divine feet of periyAzhvAr – so I do not have any deficiency. 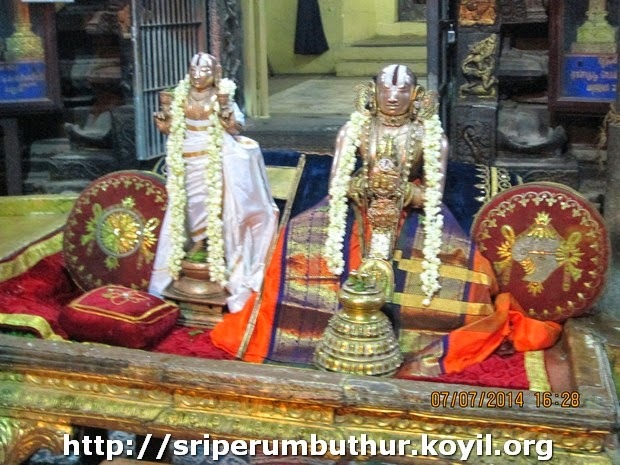 In the previous pAsuram, connected kulasEkarap perumAL with emperumAnAr, and said about the magnificence that emperumAnAr would not leave him, and celebrated emperumAnAr; in this pAsuram, after seeing the one who is benevolent to everything and protector of everything, that is sarvEswaran, he did not focus on His nature of His protecting, etc., but with the overflowing love, and with the following fear of what might happen to Him, he lost his sense and protected Him with his thiruppallANdu – that is periyAzhvAr; emperumAnAr has directed his own mind to be devoted to such AzhvAr’s divine feet; (amudhanAr says) I would not connect with those who are not dependent on such emperumAnAr’s auspicious qualities, so, he is saying, I would not have any deficiency. enakku enna thAzhvu – what deficiency would I possess? sOrAdha kAdhal – also means, love that does not shrink; means fully complete devotion. perum suzhippAl – the vortex he is caught in is not a negligible one, you see. and as said in “achithavishtAn praLayE janthUnavalOkya jAtha nirvEdha:” [In the period of praLayam (annihilation) perumAn loathed that the janthus (chEthanAs being like non-sentients) were inactive along with achith (non-sentients))], emperumAn saw that the AthmAs are lost in the big ocean that is samsAram, and loathed himself – such love towards us; such sriya:pathi. piRangiya sIr – ever growing auspicious qualities; As said in “kudhrushti kuhanAmukE nipathitha: parabrahmana: kara graha vichakshaNOjayathi lakshmaNOyam muni:” [emperumAn fell in the cave of wrong meanings propagated by kudhrishti (who understand/explain vEdhas wrongly); it was emperumAnAr who gave his hands and pulled out emperumAn from that cave (by giving srIbhAshyam)” (thus emperumAnAr is equivalent to periyAzhvar in doing mangaLAsAsanam), and made such correct meanings to grow in qualities for ever; so is emperumAnAr’s auspicious qualities are ever growing. sAra manisarai – the people who have Not considered such emperumAnAr as their destiny. As said in “nrudhEha mAdhyam prathilabya dhurlabham”, even though they are having the body of humans to use for hearing and thinking (about emperumAnAr). enakku enna thAzhvu iniyE – after this, for me who is under emperumAnAr’s kindness, there is no deficiency; there is no inferiority; as said in “thadhEvamushNAthi asubhAnyachEshatha:”, (removes all asubham (inauspiciousness)” and in “sidhdhE thadhIya sEshathvE savarththAs sambhavanthihi” (those who serve other devotees will get all wishes fulfilled), there is no problem and everything is easily obtained in my hand. Isn’t AzhvAr‘s behaviour same as normal humans who just see the beauty of outward appearance, and as normal humans wishing well the other people? In the case of AzhvAr this did not happen due to the karmas, but due to excess of his devotion and love towards emperumAn it crossed that stage of expecting something from Him, but to the stage of worrying about His safety. maNavALA mAmunigaL said, “pongum parivAlE villipuththUr pattar pirAn peRRAn, periyAzhvAr ennum peyar [updhEsa raththina mAlai – 18] (~due to overflowing love, the srIvillipuththUr‘s head of the learned got the name of periyAzhvAr). Now, can emperumAn not pull AzhvAr out of the vortex of love, by showing his greatness? It seems He was not able to. Only if one had eyes to see would emperumAn be able to show it. Here AzhvAr due to the excess of devotion was behaving like a blind and not seeing the greatness of Him; whatever emperumAn let him know as His greatness, it only increased AzhvAr’s fear for safety of emperumAn, since emperumAn would unnecessarily go to battles due to His strength. Azhvar: vishNu chiththar; emperumAnAr: vishNu chiththa chiththar. Since he is always keeping periyAzhvAr in his mind, emperumAnAr also becomes like periyAzhvAr; AzhvAr made emperumAnAr also to look for people who could do mangaLAsAsanam to perumAn; the details of this is present starting from chUrnikai (sentence)-255 in srI vachana bhUshaNam. sArA manisaraich chErEn – here amudhanAr did not say he would only go with those devoted to emperumAnAr; instead he says, he would not go with those who are not devoted to emperumAnAr; this is to say, even if you do not do the good aspect, at least avoid the bad aspects. This entry was posted in iyaRpA, rAmAnusa nURRanthAdhi on November 9, 2015 by raghuram.